Visit a Cheesecake Factory on September 30th (and bring two cans of soup). Purpose? Helping to Drive Out Hunger. September is Hunger Action Month, but before October begins, there is still one more way to take a stand in the fight against hunger. The organization will then use the donations to assist food banks in our area. Easy to do, the whole dine-out-and-help plan. Even the name of the promotion is simple: You Dine, We'll Donate. Find a location near you. 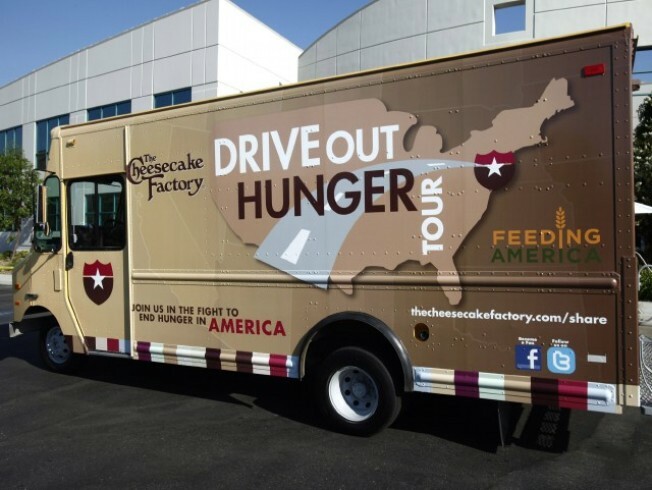 Were not sure if the Drive Out Hunger tour van will be outside the restaurant you choose, but we hope you saw it as it traveled the nation over the last few months collecting soup and raising awareness. Find out more about the tour here. And even though September is ending, you can still take action. You can give support to Feeding America online, regardless of month, date, hour, or location. The "Give-A-Little" calculator is a very helpful tool -- check it out.